Paracas, Peru has been the perfect venue for the South American Youth Olympic Games Qualifier and although numbers don't tell the story they are for sure part of it: 23 sailors from 7 countries, 15 thrilling races in 4 days, 15 - 23kts and 25*C. "Paracas is the place to come for windsurfing" said Piotr Oleksiak Techno293Plus Class Representative at the event. "The conditions have been just marvellous, allowing us to have both course and slalom racing, nice and close to the beach." 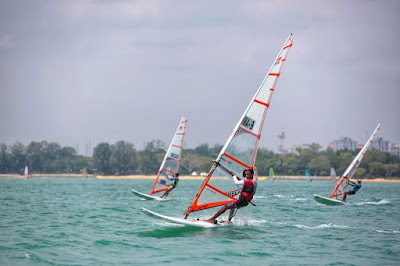 It was slalom that attracted many of the young competitors including Raul Claux from Peru, who commented on the format just after finishing for the day - "It was very good. I enjoyed slalom racing. The wind was very strong, the conditions tough, but finally I advanced one position. I'm happy with the performance. It was a good day for me. I'd really like slalom racing in the future. I love slalom. I practice slalom with a slalom board, this was my first time with Techno293Plus and it was great. I felt really good on the board today." Thanks to their performance at the event it will be Peru and Brazil joining Argentina at the YOG in both Youth Men and Youth Women fleets. Congratulations to all the sailors. Next stop - European YOG Qualification Tournament in Sicily.